January 22, 2019 - No Comments! The goal of the project was to gather as many Facebook Messenger subscribers as possible via a viral giveaway. We nailed it! We just run a Referral Marketing campaign via Facebook Messenger. Btw, Viral Loops for Messenger is live on Product Hunt! A little context before we proceed. 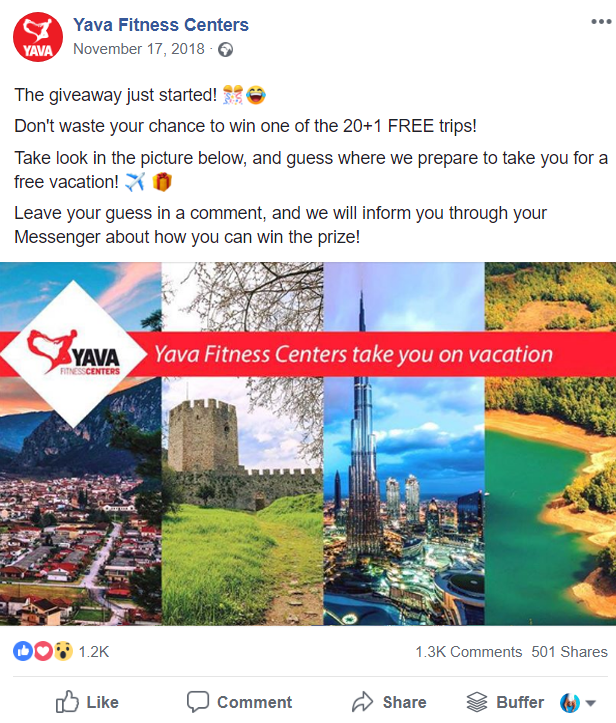 Yava is the biggest gym chain in Greece, with 50 branches throughout the country. They came in touch with us to help them build a huge giveaway. 20+1 trips to (almost) open destinations. The giveaway run in a time span of 20 days; that means that we gave 1 trip every single day! Users participated by subscribing and could get more entries (increasing their chances to win a trip) by inviting their friends and family to participate as well. As I wrote in the beginning, the goal was to gather messenger subscribers. Up to now, giveaways that worked with a referral program registered participants with an email address. That means that after grabbing the users’ email address, we should email them in order to subscribe to the page’s Messenger. We knew that our funnel would leak a lot. We would lose a huge number of people that could potentially bring us more participants. This approach canceled the very reason we decided to go with Facebook Messenger for the giveaway in the first place; it’s the platform with the highest rate of use, with open rates that put every other platform to shame. We had to get email outside of the equation, and there was no system that could do this. We had to build it ourselves. And goddamn, we did it! 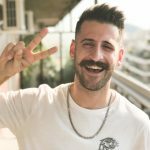 We’ve built the product, run the giveaway and (as the title of this post gives away), we managed to gather 35K Facebook Messenger subscribers in 20 days. We took all the knowledge we had on Messenger bots (and especially Manychat) and created a seamless referral marketing experience. By using the flow we created in Manychat we were able to track every referral (who invited who) and provide the extra entries for the giveaway accordingly. This exact flow, combined with Viral Loops’ technology for referrals, could be your best friend for running giveaways. Change the number of participations for each new entry & successful referrals. Insert some keywords that trigger possible automated flows (e.g. show the number of participations the user has). Craft a compelling copy that will communicate the value of your giveaway! Viral Loops for Messenger is live on Product Hunt! Now, back again to the case study! We had the tool, and we had the flow. It was about time to find the ways that people would be able to discover and participate in the giveaway. Obviously, the first thing we needed was a landing page that converts. We included the main call-to-action above the fold and added a counter to communicate the sense of urgency. Below the fold, we included as much info as possible about the rules and prizes of the giveaway. By clicking the call-to-action, users were asked to give permission to be subscribed to the page’s Messenger, and thus, participate. Since Facebook is the “father” of Messenger, we had to go hard with it. We scheduled posts that spread the word about the campaign, including all the details in the copy, and the URL that people could use to have a chance to win. We did the same with Instagram posts and boosted them with ads to get in front of as many eyeballs as possible. Paid advertising offers a good initial boost, but we also need a great deal of organic reach in order to reduce the CPC of the campaigns. We managed to do so by taking advantage of Manychat’s Comment to Message Growth Tool, as you'll see in the screenshot below. A widget/popup was also added on the company’s website, aiming to inform mobile or desktop visitors about the giveaway and prompt them to subscribe to Messenger and enter the giveaway. In order to reach existing customers/subscribers, we used newsletter & SMS campaigns. Since the company is the biggest gym chain in the area, we knew that we had to also leverage the people that hit the gym to exercise. For that reason, there were banners in each gym with a Messenger scan code (another Manychat Growth Tool) that also included a clear direction on how people can use it to participate in the giveaway. About 8K people subscribed using the scan code from the banners. At this point, I have to tell you that before the actual giveaway begun, there was a short pre-launch period (8 days). 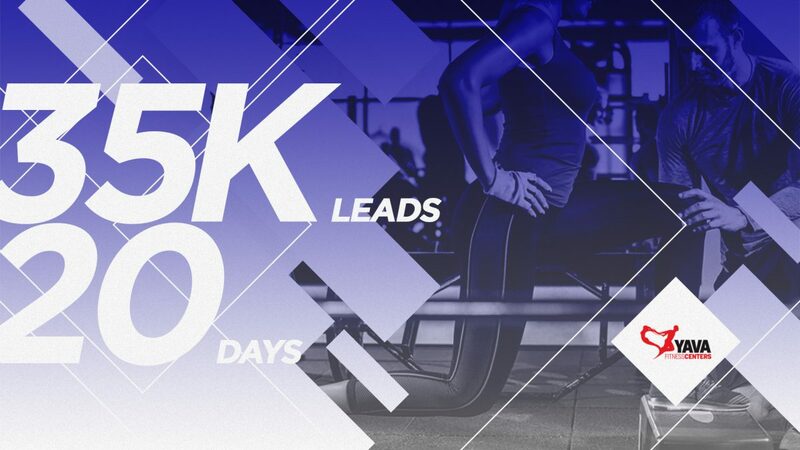 We decided to give a head start to the existing gym members, website visitors or social media followers; this also allowed us to test the potential demand for the giveaway. For the pre-launch period, we used a Facebook post with Manychat’s Comment Growth Tool, asking people to leave a comment with their favorite travel destination. Whoever left a comment under the post received a message to their Messenger, asking for their permission to subscribe them to the pre-launch. The same applied also for people that came from the widget on the website, or the banners located in the gyms around the country. Let’s have a look at how the flow looked like for people who got into the giveaway after the official launch. The last card is what we named “personal invitation”, which prompts the user to share about the giveaway after they subscribed. By entering, users got ONE entry for the daily raffle- since we could give 20 free trips, we decided to have 1 winner every day for 20 days. In order to obtain more entries, the users should share about the giveaway with their friends/network. Every time a friend of theirs subscribed for the giveaway, the referrer gained 10 extra entries. The flow we’ve built did all the referral tracking, and the subscribers could go back to Messenger at any time and find out how many entries they have, simply by typing “Entries”. A similar message was sent after another 2 days (again with a smart delay). Now that I gave you the small details about the campaign, let’s see some numbers. We gathered 34819 Messenger subscribers in total. 1208 out of the total, subscribed during the pre-launch. 15383 participants came from a referral. The last piece of data shows us that 48.8% of participants came to the giveaway from a referral. After the campaign ended we were really happy with the results. Our experience has shown that the performance of every campaign relies on luck, only by a small percentage. We knew that we did something right, and we wanted to document it! It took people only 2 clicks to share about the giveaway. Hence the 48.8% of referral participants. There were enticing & recurring rewards. Participant saw that there were daily winners, and that kept them trying to win. We leveraged all the available channels and mediums. Banners, social media, newsletters, etc. The messaging was engaging and fun. We kept receiving replies with people telling us how funny the gifs that we used were. Even though the messaging was short, it was to the point. It didn’t leave people wondering about the details, without getting too much into them. Why run a referral marketing campaign via Messenger? The explanation is simple. Messenger as a platform has better engagement (open rate, CTR, etc.) than any other platform right now, and people are really used to using it. It’s easy for them. And the most important; their friends are used to receive content from them. In addition to that, your brand/company can really start a more human conversation with its audience. You can download your Messenger subscribers’ psids directly from Manychat & and use them to build audiences for your ads. Just be gentle with that, ok? Want to build your campaign? We got your back, partner! Viral Loops for Messenger is now available for you to run your giveaway via Facebook Messenger! We can help you set up your campaign and start collecting leads! Build your Messenger Referral Marketing Campaign now! If you wanna know even more, you can join our FREE webinar about Messenger Giveaways. Why Messenger Marketing is awesome. What can Viral Loops do for you. What does our Messenger template include. 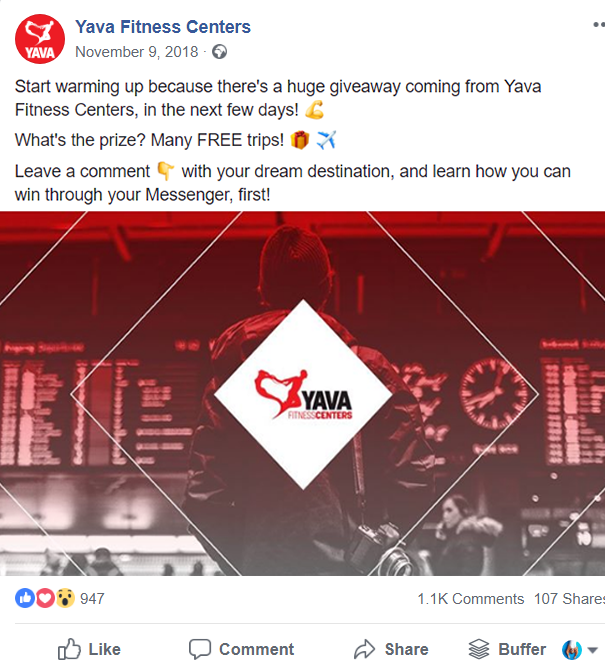 How to set up your Messenger giveaway campaign. A live example of how it works.